This is my new favourite thing. 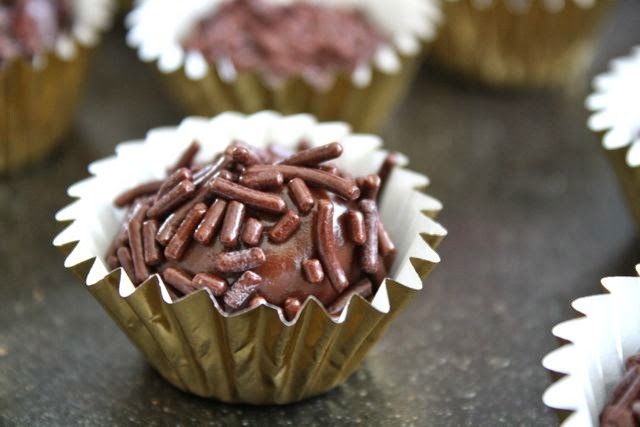 It's called a brigadeiro and I think I could eat about ten of them in a row. I know, it looks like a plain old chocolate ball with plain old chocolate sprinkles on top. But appearances can be deceiving. This is actually a little bit of dark-chocolate-dulce-de-leche heaven. I know. 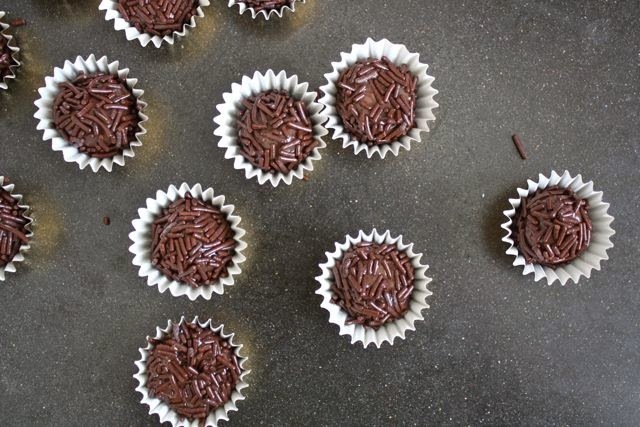 Where have brigadeiros been my whole life? Apparently they're always served at children's birthday parties but while the adults say they're making them for the children, they're actually making them for themselves. I found the recipe while I was madly hunting the internet for dessert recipes from Brazil. So I found this recipe for brigadeiros and decided to make it because I already had all the ingredients in the house. That's pretty easy with just four ingredients: cocoa, sweetened condensed milk, butter and chocolate sprinkles. I also unearthed little tinfoil cups that I bought years ago on a whim – obviously foreshadowing my brigadeiro discovery. The recipe itself is also simplicity in a heavenly form: cook the cocoa, sweetened condensed millk and butter together and watch magic happen. The sweetened condensed milk caramelizes and almost becomes dulce de leche, even while it's binding with the chocolate and butter to create a whole new soft ball of deep, dark enchantment. 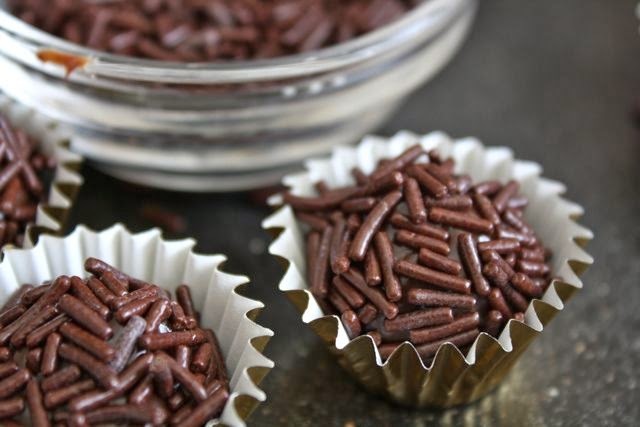 The final texture is so soft it almost melts but just manages to maintain its shape with the chocolate sprinkle coating and it is so, so good that the brigadeiro might just become your new favourite thing, too. Get out a dinner plate and spatula, and set it aside. Put the butter, sweetened condensed milk and cocoa in a medium pot with a good heavy bottom. Turn the heat up to medium, and whisk often while it comes to a boil. Once it's boiling, set the timer for 10 minutes and keep stirring often to prevent it from sticking. Turn it down slightly if you think it's sticking – but you want it to cook between a simmer and a rolling boil. The mixture will thicken, and by the end of the cooking time big bubbles will come to the surface as it boils. Quickly use your spatula to scrape the mixture onto the plate. Set in the fridge for a couple of hours to cool and firm up. It will never get that firm, but it will be firmer by the time you go to roll the balls. Put out a small bowl with chocolate sprinkles and set out about 30 foil cups. 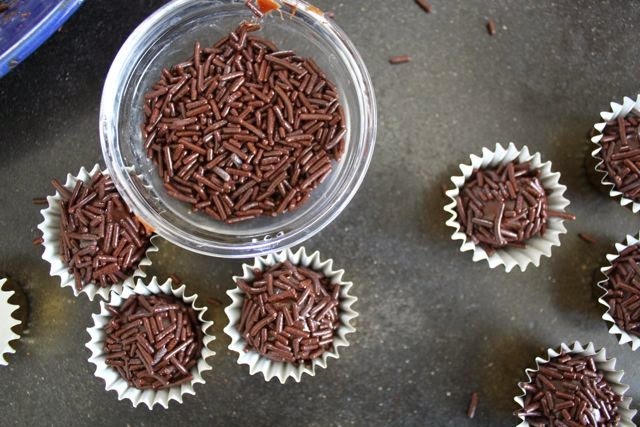 Butter your hands so the brigadeiros don't stick. Take a teaspoon of the mixture and roll it to make a bowl. Roll the ball in the sprinkles and place it in a little foil cup. 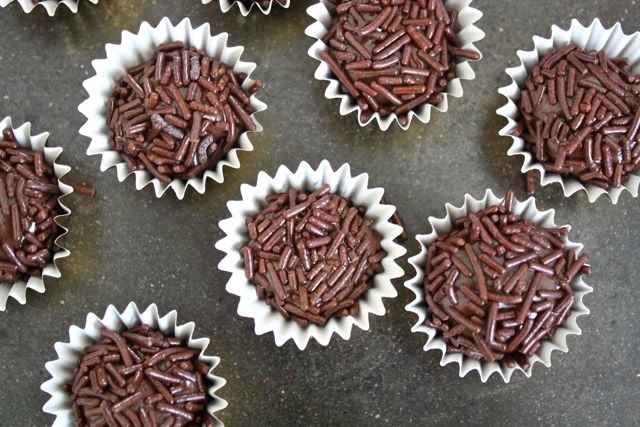 Repeat, until you've made all your brigadeiros. Serve at room temperature or refrigerate until needed. Not sure if my last comment worked but just wanted to say I think these will make the perfect gift to take to friends at Easter! These sound absolutely heavenly! I will proceed to hunt Arctic Norway for sweetened condensed milk. Wish me luck! Good luck! I'm not sure how popular sweetened condensed milk is in Arctic Norway, so I will be curious to hear what you find . . . I don't suppose there's a South American import store up there?? ?